Martin was born in Knaresborough, and educated at Rutherford Grammar School, Newcastle upon Tyne, and at Taunton’s School, Southampton. He read for the Honours Degree of B.Mus. at the University of Birmingham, and followed this with a further year at University College, Cardiff. It was whilst at Birmingham that he began conducting, organising his own concerts with the University Orchestra. 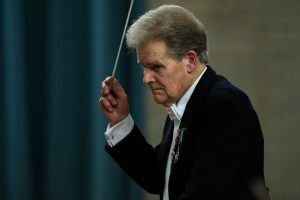 He studied conducting with Sir Charles Groves and Louis Frémaux whilst they were the Conductors of the Royal Liverpool Philharmonic Orchestra and the City of Birmingham Symphony Orchestra in the 1970s. In May 1970, Martin was appointed Conductor of the Leeds Symphony Orchestra. During his conductorship, the orchestra’s repertoire has been very wide with music from the seventeenth century to the present day, including several commissioned works. Perhaps particularly noticeable has been the inclusion of much French music, especially Berlioz, Debussy, Ravel and Saint-Saëns, whilst the three most frequently performed composers are Mozart, Beethoven and Berlioz. As Artistic Director and Conductor of West Riding Opera, he has conducted more than two hundred and fifty performances of over forty operas. Several operas have been given their first-ever productions in the North of England, such as Weber’s Euryanthe and Oberon, Delibes’ Lakmé, Lalo’s Le Roi d’Ys, Bellini’s Il Pirata, Marschner’s The Vampire, Lortzing’s The Poacher, and Berlioz’ Béatrice et Bénédict. Martin has worked with several choral societies in Yorkshire, and recently conducted major works by Charpentier, Vivaldi, Purcell, Handel, Bach, Haydn, Mozart, Beethoven, Schubert, Berlioz, Saint-Saëns, Rossini, Fauré, Parry and Orff. He is a guest conductor of the Oslo Conservatoire Orchestra and of York Opera. His active interests include cricket – he plays with Arthington C.C. He is married with two sons. In recognition of his services to French music with the Leeds Symphony Orchestra and West Riding Opera, the French Government appointed him Chevalier de l’Ordre des Arts et des Lettres in 1993. He received the insignia from the French Ambassador in May 1994. In Her Majesty the Queen’s Birthday Honours List of June 2014, he was appointed MBE for services to music in Yorkshire. 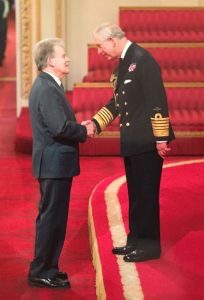 He received the insignia in February 2015 at Buckingham Palace from HRH The Prince of Wales.